After the USA backed away from its commitment to supply 25 F-86F Sabres under MDAP, Chile turned to Hawker for the supply of Hunters in 1966. The Fuerza Aérea de Chile received an initial batch of 15 FGA.Mk 71s between September 1967 and June 1968, followed by three FR.Mk 71As and three T.Mk 72s. These trainers and reconnaissance aircraft were added to the initial contract after signature. The first aircraft equipped Grupo de Aviación No. 7, formed in Los Cerrillos in May 1968 to operate the Hunters. Further orders brought the delivery of 13 more FGA.Mk 71s, three FR.Mk 71As and two T.Mk 72 in several batches between 1970 and 1974. These batches allowed the re-equipment of Grupo de Aviación No. 9, "Las Panteras Negras" in May 1970 and of Grupo De Aviación No. 8. President Salvador Allende was overthrown in a coup in September 1973, during which Chilean Hunters bombed and rocketed the Presidential Palace. Arms embargoes were imposed and subsequently the number of aircraft available on the frontline units plummeted, because of the blocked delivery of spares and even of engines being overhauled in Great Britain. Grupo 7 re-equipped with F-5Es during 1976 and Grupo 9 deactivated in 1981, leaving all surviving Hunters with Grupo 8. 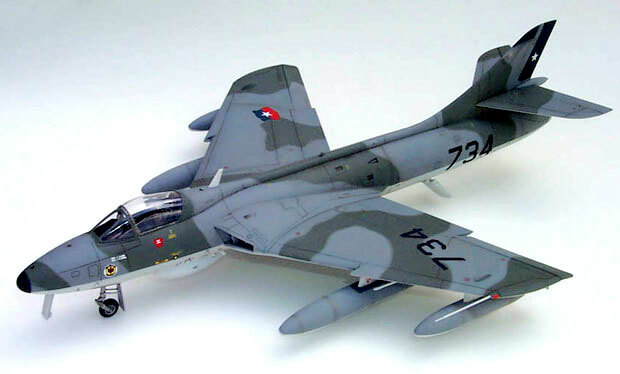 As war between Argentina and the UK loomed in the South Atlantic, the RAF airlifted eight Hunter FGA.Mk 9s to Chile in two batches of four on April and May 1982. Following the Malvinas/Falklands War, four more FGA.Mk 9s were delivered in November 1982. It was assumed that the Hunters were supplied in return for "services rendered", in the form of basing for RAF reconnaissance aircraft and Special Forces helicopters, C-130s and troops. Some sources suggest that a number of (British) Canberra PR.9s flew from Chile, carrying low-vis black-outline Chilean insignias. Also soon after the war, these RAF Hunters were augmented by a pair of ex-Kuwaiti T.Mk 67s, possibly taken back from Oman. The last Chilean Hunters were retired in a ceremony in April 1995 which also celebrated the arrival of the Dassault Mirage 5M Elkan into FACH service, but were then kept on for limited tactical reconnaissance and training duties, pending delivery of Chile's reconnaissance-capable Mirage 5BRs. 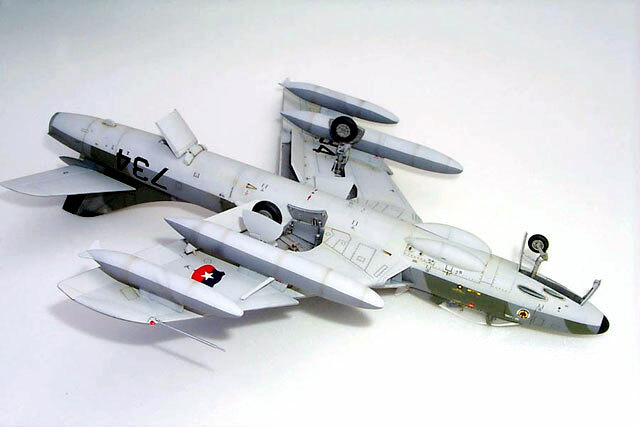 The very nice 1/48 scale Academy Hunter kit was painlessly built out from the box with the only addition of the blade antenna right behind the canopy and a resin ejection seat to replace the under-scaled plastic seat included in the kit. Paint used throughout the whole project was from Testor's Model Master line, including British Dark Sea Gray and RAF Dark Green, lightened with a drop of white for the topside camouflage which was created by following a great masking technique kindly shared by Drewe Manton, using Blu-Tack and Play-Doh modeling clay, the later being my variation to his use of marking tape. Future was used as gloss coat before decaling (canopy and windshield were dipped in Future also) and weathering was given with Burnt Umber artist's oil diluted in turpenoid and some touches of grounded pastel chalk. Finally, Testor's Dullcote was applied for the final coat. Decals came from the Brazilian brand "FCM Decals", set #4801LA plus stenciling from the kit's own decal set. 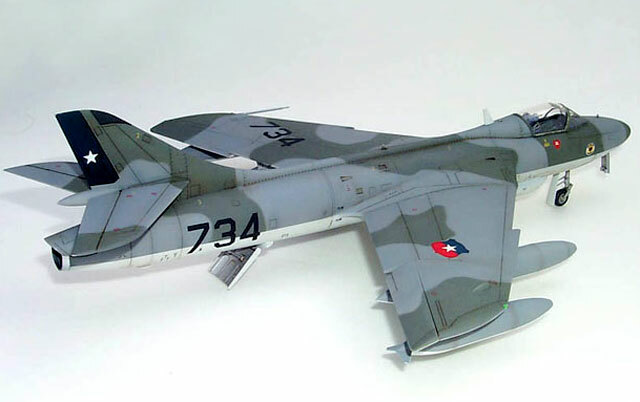 A last note, especially in respectfulness to fellow Chilean (and Latin American theme) modelers: this Chilean Hunter J-734 was in fact a FR.Mk 71A and not a FGA.Mk 9 as I depicted it here, but I did not realise until it was a little too late to step back.